Winter’s fast and furious arrival has us scrambling. It’s a lot harder to get the farm ready for winter when it’s already here! The good news is that most of our greenhouse crops survived last week’s unseasonal plunge to -25. Thursday was the coldest day, but sunny, so we uncovered the plants to give them more light and air flow. Below you can see our staff Piotr uncovering the plants at the back of our long greenhouse, after we uncovered the front half. By 11 am that day, it was still -15 outside, but greenhouse air temps were between 8 and 14 degrees! We don’t heat the air, so that was almost entirely the effect of the sun. It was a good reminder of how effective, and how crucial, sunshine is for our system. Because we heat only the soil, we rely on sunshine (and the ‘greenhouse effect’) to warm the air to the point where plants will grow in winter. On cloudy days, the greenhouses are only a few degrees warmer than outside, which doesn’t support much growth at this point. This fall has been unusually cloudy and cold. This graph is a recent 14-day forecast. 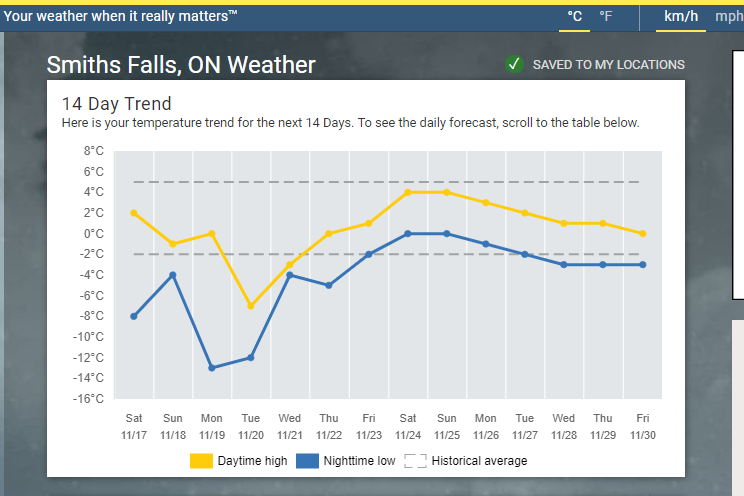 The yellow and blue lines show daily highs and lows, while the grey dotted lines show average historical temperatures for this time of year. Typically about 40% of daylight hours are sunny in the fall in our region, but this fall we’ve averaged only about 12%. Combined with subzero temps and snow much earlier than normal, our greenhouse yields are really suffering. We’ve had to stop our wholesales early to put everything we grow into our Fall CSA, which is a big financial loss for us. Part of our motivation to get into farming was to learn to adapt to a changing climate. 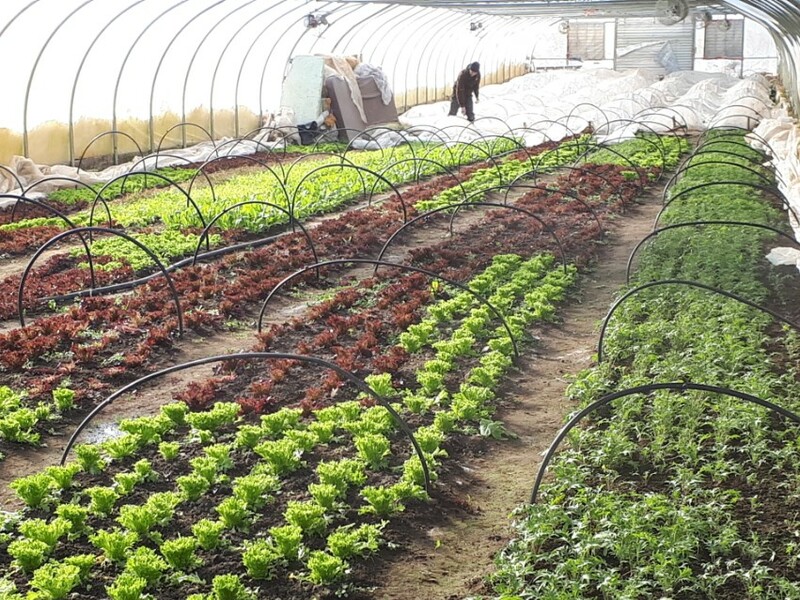 We invested in a heated greenhouse system because it offered us a buffer from outside growing conditions, extended our growing season and allowed us to produce more in a small area (offsetting the poor soil quality of our land). 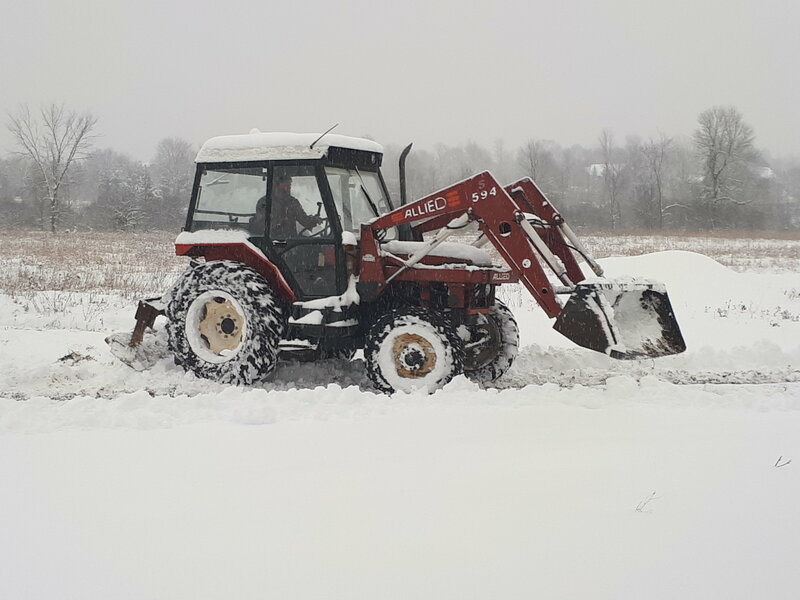 But as the weather continues to be less predictable and more extreme, it may be too risky for a small farm to rely on growth in the shoulder seasons. Our niche is very precarious: this year we lost a month of spring sales to April snow and ice storms, and a month of fall sales to cloudy weather and November snowstorms. Following a year of flooding in 2017 and a year of drought in 2016, there doesn’t seem to be any ‘normal’ weather anymore. For now, we keep plowing through our winter prep list, just more slowly through a blanket of snow. With four weeks to go in our Fall CSA, our fingers are crossed for a little more sunshine, but we aren’t holding our breaths. “Our system is sun-driven,” Brad said to our neighbour the other day. “I’m sun-driven,” replied the neighbour.